Hello, my darlings!! Firstly, I feel as though I need to address the whole Wing Challenge thing. When I stated that I was going to eat chicken wings every day for a week to find the best wings in Durham Region, I didn’t take into consideration the deterioration of my intestinal health by the time Day 5 rolled around. Quite honestly, I needed to do five colonics and a juice cleanse for three days to get everything moving again. Super gross. I didn’t think it was fair to eat and rate chicken wings on Day 6 when I was literally sick of Chicken Wings, although I DO think that I graded the first four restaurants fairly. The chicken wing challenge will continue, Sweethearts, but I’m stretching it over a couple of months, not a week. It’s only fair. That being said, I need to talk about something very serious. The Reuben Sandwich. I spent most of my youth being dragged around every city we happened to be in at that particular time, so that my dad could have the perfect Reuben. We’ve been to hundreds of delis from Montreal to NYC to a dark, dank restaurant in Munich that my father claimed had one of the best Reuben’s that he’s ever had. Apparently, the perfect Reuben needs to have the perfect Russian Rye Bread, the tastiest, freshest corned beef and the sourest of kraut. In my humble opinion, the Reuben Sandwich at Teddy’s Restaurant & Deli in our beautiful Oshawa is almost perfect. Paired with a giant dill pickle and their homemade potato salad, it can almost cure any troubles that one might incur. Also, how can anyone resist their homemade salad dressing?? That stuff should be world famous. There isn’t a time when my fridge doesn’t have a fresh bottle in its shelves. 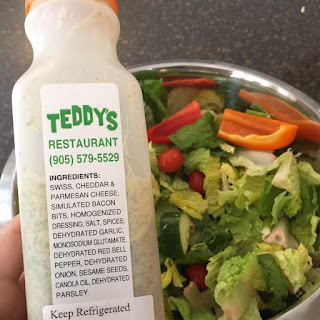 But this review isn’t about Teddy’s. It’s about a gorgeous Reuben Sandwich that I found quite by accident last Sunday in Bowmanville. My darkly handsome husband and my brilliant six-year-old son were enjoying the sunny day at the park down by the Bowmanville waterfront, throwing rocks into the lake and poking stuff that washed up on the shore with a stick. I, personally, was not poking stuff with a stick, though, because I’m afraid of stumbling upon a dead body, which in turn will cause my therapy sessions to go up to four times per week. I’m not kidding. When I was in grade two or three, some friends of mine found a dead body in the woods across the road from my house in North Oshawa and I’ve been both grossly fascinated and deathly afraid of happening upon a DB in the woods ever since. Anyway, after playing down by the water for a few hours, we were ready for some lunch. The Olympia downtown had a line out the door, so we looked around for somewhere else to go. We could see what looked to be a Pub down one of the side roads and ventured over. It was called Copperworks Brew Pub Restaurant, and the exterior looked super cute. I was super glad we stopped in. The pub is split up into three rooms – a bar area, a lounge-type area with TVs and big round tables and a more formal dining area. All three had that English-pub vibe. It was early in the afternoon, so the place wasn’t really busy. A few diners ate in the dining room, one table of men were drinking beer in the bar area, and we decided to grab a table in the lounge area. The menu was vast and had a little bit of everything. Our server was lovely, friendly and very knowledgeable about the menu. She was really cute with our little guy, too. Made him feel muy importante, which he’s used to, considering he’s an only child and the apple of both our eye. And super smart. And handsome, too. I liked the feel in this joint. We were seated right by the door to the patio so I could get a glimpse of the outdoor area. Yes, I can see my girlfriends and I out there on a hot summer night, enjoying a pint or two and talking about all of the Real Housewives franchises. When our food came to the table, I was very impressed at first glance. My Reuben and my husband’s Club Sandwich were giant. My son’s chicken fingers were actually homemade breaded chicken breasts, and his salad looked extremely fresh. The server even added more purple onions as per the little prince’s request. I really wasn’t expecting much from this Reuben from a little pub in Bowmanville, but it was delicious. The marbled rye was so soft and fresh, and the corned beef was tender and salty, just like I like it. Also, being Ukrainian, I have a super-secret built-in sensor for quality sauerkraut, and this was it. Inside this delightful package was a sweet honey mustard that rounded out the whole sandwich. I loved it. A super-duper find for me!!!! My kid LOVED his chicken fingers and salad, and my husband claimed that his Club was “pretty good”. That means that it was delicious. This is the first time I had ever seen this place, and I had never heard about it before. I wonder if it gets happening in the evening? It looks like it would be the perfect place to watch a game or meet friends for beers. We have lived down the street from Copperworks, formally Maddies,Formally Braemar for many years. It had gone through some minimal changes over the years but the new owners, Tina and Pat , have really stepped it up. If you're a sandwich eater and dont want the Reuban , try the Industrial sandwich! You wont need to eat for awhile after that beauty. The patio is great in the summer with live music but the newly renovated back room is a great spot for gatherings or parties. The musicians are always top-notch.